YOU are a psychiatrist, trying to solve a murder whilst treating the unusual patients of the recently deceased Doctor Dekker. Type a question - patients reply in full screen video and have questions for you too but be careful what you say. Your words determine their eventual fates, and your own! 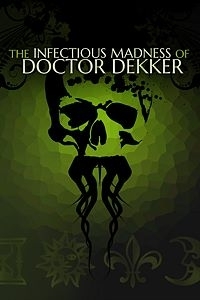 Finding out who killed Dr Dekker is only one part of the puzzle; working out how to fix the chaos he left behind will be so much trickier… As well as providing clues to the murder, each patient has their own bizarre problem they need your help with – from time manipulation and re-animated loved ones to horrors under the sea. Complete with an atmospheric soundtrack, The Infectious Madness of Doctor Dekker invites you to explore the shadow reality that your patients inhabit – a world full of paranormal strangeness and horrors that go bump in your head, where all you have to rely on is your own mind. FMV - 1600+ HD full-motion video responses. RANDOM MURDERER - Chosen at the start of the game to combat spoilers. FREE TEXT INPUT - Ask whatever you want, type questions, phrases or keywords will full touchscreen support. SUGGESTED QUESTIONS – An additional question system optimised for console. SIMPLE UI - View evidence, make notes, watch replays, and see your question history.